Miniature donkeys, we are ready for you. I can’t even explain in words the number of hours we spent contemplating this fence. What type of posts to use, how far apart to put supports, what type of fencing, and where to get everything. The length of time it took us to make these decisions is likely responsible for the fact that we were installing the fence in 35-degree weather, 24 hours before we were blessed with our first inch of snow. To spare any future fence-installers up here in the northern climates those frozen fingers, let me share with you what I learned. I’m pretty insistent on a split rail fence, strictly for looks, and will have it on two sides of this pasture. Eventually. 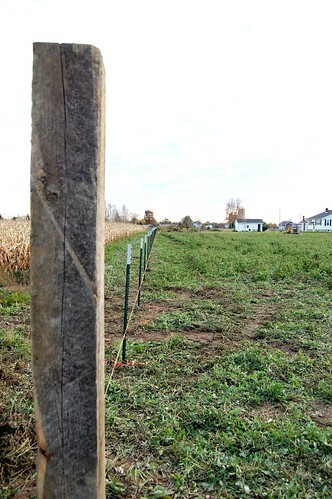 The other two sides of the pasture and the back of the property will be T-posts with woven-wire or “horse fence” as MysteryMan’s grandpa calls it. Post and board fencing- You see this around horse pastures a lot. It reminds me of Kentucky. My grandparents post and board fence lasted a good 30 years, so it’s worth the money, but I think it’s safe to say, once it’s in, it’s in. So plan ahead. Split-rail fencing– Like the post and board, it’s not ultra flexible and it costs some, but it’s quicker to install than a post and board. 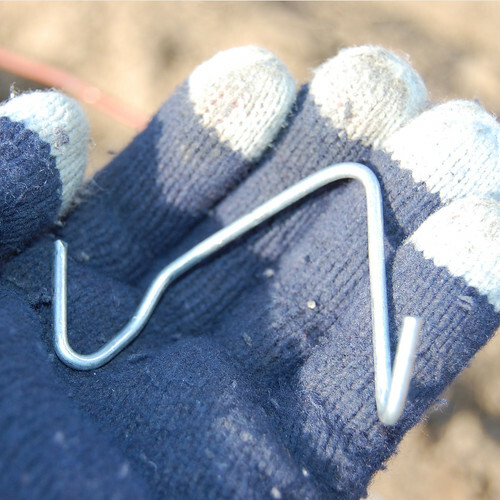 For a pasture, or to keep the dogs in, you’ll need to attach welded or woven wire to it as well. 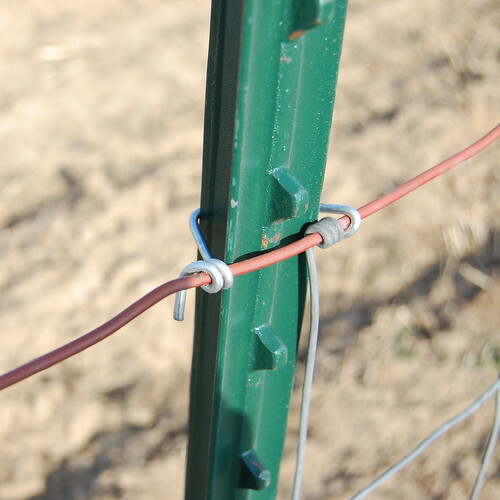 Electric fencing – Benefits: You may be able to zap unsuspecting neighbors with it. Practically, it seems pretty easy to string a couple of the hot wires up to some posts. Quick, easy, lots of flexibility, but it does require electricity (ok, duh) and that can cost, also, repairs are probably something to think about. And whether or not you’re clumsy enough to accidentally bang into one of these. 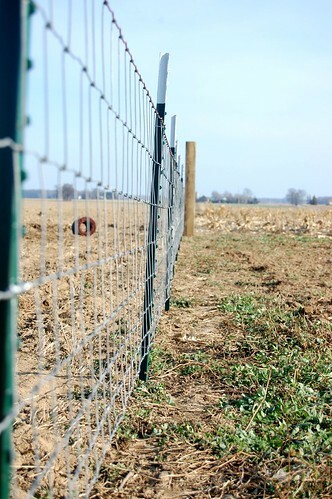 Welded wire fencing – A light-duty version of the woven wire/ horse fence, this one can be strung with lightweight T-posts as well. If you’re looking for materials or tools, Tractor Supply is the place to go, unless you have a local fence company. We did a lot of price shopping and didn’t find significant savings anywhere, but TSC had the most options to choose from. Check out their selection of fencing products here. Unfortunately you can’t order online, but you can call in or order through a store. Anchor posts should be at the corners or ends of the fence, and every 30- 50 feet throughout the length of it. T-posts should be every 10 feet. T-posts have “blades” on them that should be buried, again, at least 2 feet for a 5 foot fence I would think. T-post “banger” – or “post driver” as they are more appropriately referred to. Like this. 1.) We set the corner posts and marked the T-post and anchor post locations, then put the anchors in first since it took the most time. (String line, dig hole, level post, concrete in place, rinse and repeat til finished.) The anchor posts were set on the “inside” of the fence, so the wire would go on the outside and around the corners. 3.) The fencing gets rolled out. If you happen to be the person holding the other end of the wire, don’t let go. Or you’ll be chasing a rapidly re-rolling bit of fence for then next 150 feet. Not that I’d know from experience, but I suspect it could happen. 4.) Once the “frame” of posts was up (the T-posts being significantly faster to install than the anchor posts, but also significantly harder to keep level) we stretched the fence. 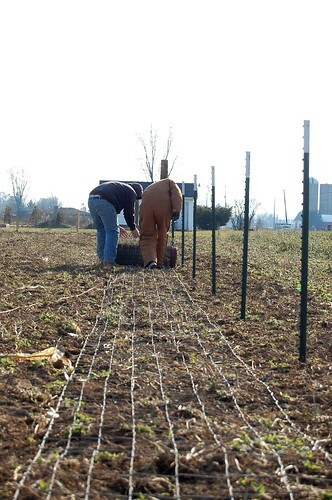 Conventional wisdom says to attach the fence to one corner/anchor post with U staples/nails, and then put a temporary post in the ground beyond the other corner or anchor post, which you will attach the pulleys to in order to stretch the fence. We thought that seemed like a lot of extra effort, so we decided to use the truck as our stretching post instead. I hear the fence should be stretched until the little V shaped crimps in it become about 1/3 straighter. I have no idea how a person would eyeball that, so we went with the “straight, taught, looks good” method. Don’t knock the gloves. I lost my work pair somewhere and this was what was available to me to keep my fingers from freezing and breaking into a thousand pieces. In any case, these clips baffled me for about 3 minutes, and thank god I decided to own donkeys with an engineer or I might still be out there with my blue-tipped-blue gloves. One side has a longer end, and if you bend at the kink everything with tighten up nicely. Finish it off with another wrap and tighten down the other side of the clip. 6.) Get donkeys. Enjoy life. Now I just have to build the donkey shelter sometime before spring. 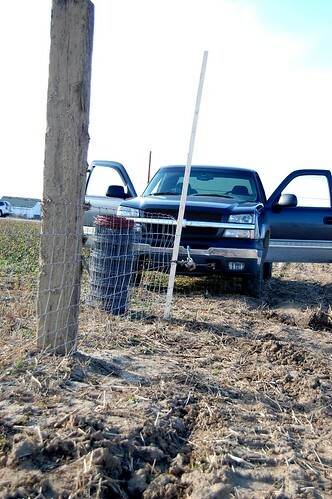 Constructing Wire Fences – From the University of Missouri. I love your photos! I can almost see those little donkeys now…..btw, the 3k mattress is not really impressing me too much right now. But it’s still early, and could take awhile ot ‘break in’ so jury is still out. The man loves it, though! Contain you ever considered adding further videos to your blog posts to maintain the readers extra entertained? I mean I barely read through the entire article of yours and it was fairly famous where as I’m extra of a visual learner,I found that to be more practical healthful let me understand how it turns out! I love what you guys are always up too. Such clever work and reporting! Hold up the fantastic works guys I’ve added you guys to my blogroll. This is a huge article thanks for sharing this educational information.. I will visit your blog regularly for various latest post. sad times my favorite neighbor moved back to LA to film for the wire. *sighhh* he’ll be back soon enough though! Could you email me with some hints on how you made this blog site look this awesome , I would be appreciative. your instructions for putting up a fence are great!!! thanks! We are excited to be planning for our baby mini donkey. the mom was just bred last wed. so hopefully our baby will be born next march. then weaning time we get to bring him or her to our house.. Did you happen to build your mini donkey enclosure yet?? would love to see how you did that.. We are new to having outdoor animals. chickens are coming soon. then our donkeys are next. This was a great help! Three intelligent (?) adults could not figure out how those clips worked. Thanks for the photos. 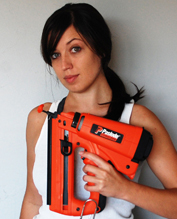 This is very great post about fencing products. Well after reading this beautiful and informative post on fence, the former can easily choose the right fence for their garden, forms or landscape. Awesome post, thanks for the good explanation of the process and the pictures. I used your post to install a fence to keep our boxer safe. We just got horses and I think I want to find some wire fencing in Calgary. At first I was scared it wouldn’t be strong enough, but it looks like it will hold up great. Thanks for sharing this! Great pics!!! We have been wanting to do a similar diy project with wire fencing calgary. Thanks for sharing!!! thank you so much for the article. i have been struggling with fence construction for a few months now. your article gives me the last little bit of encouragement i need to give it a try. Thanks..great helpful article. need to build shelter now for the little sheep. Wow, this article is pleasant, my sister is analyzing these kinds of things, so I am going to convey her. A very big help and great instruction! You are hysterical! Loved this informative how to article. Loved the pix and btw your sense of humor was a welcome bonus. Rock on! Awesome and entertaining, Thanks Guys! Hey! I know this is somewhat off-topic however I needed to ask. I will be able to share my personal experience and thoughts online. Undeniably believe that that you said. Your favorite justification appeared to be on the net the easiest thing to bear in mind of. about worries that they plainly do not understand about. When I was trying to remember how to build a fence, I knew I had to come here. We’ve been talking about a fence for about 10 years now (right after we took out the scary old one) but this year I’m doing it even if I have to dig and pound in every post myself! Thanks for the great info. Love this! I laughed while reading it, thinking about myself helping my husband put our fence up very soon. Hey there just wanted to give you a quick heads up. The words in your content seem to be running off the screen in Internet explorer. great ideas! i remember after moving into my new home in North Palm Beach, the last item on my list of projects was the fence. I got six different quotes and chose Fence Crafters not just because they were affordable but also I got a good vibe from them during the bids process. My gut feeling paid off. Their team completed my fence professionally, efficiently and affordably. I would highly recommend this company for any fence job, large or small. Thanks for an informative, fun article. Nice job. Nice fence, just be sure to put end caps on top of the T posts so the donkeys don’t get skewered on one of them. Such great info in your blog and I literally laughed out loud several times. I definitely things we were cut from the same cloth!….. I wanted to give you and others who may be reading this a tip on the fence ties…. 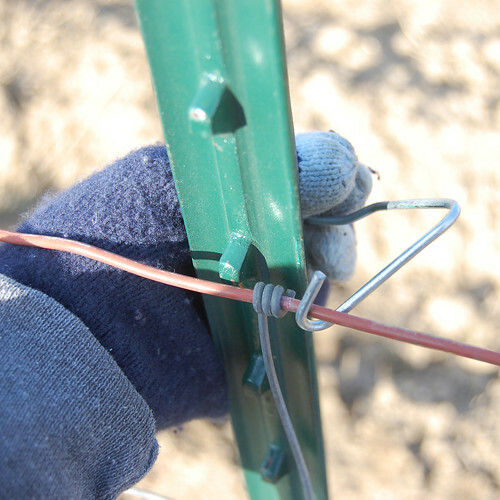 On the end with the J hook, wrap it around the wire exactly like you have it… But the other end, (the one with the A-shaped bend), place it around the post & set it on top of the horizontal strand you’re tying, grab a beefy screwdriver (Phillips head works best) and place the tip through the hole the wire tie makes with the fencing strand from underneath on the back side of the horizontal wire, and pull up on your handle. The tip of the screwdriver will wrap the tie around the wire without a problem. Once you get the hang of it, you’ll have a tie on in less than 3 seconds and without the headache of fighting a pair of needle nose or linesman pliers. It will literally take longer to get the tie out of the jumbled up bad of ties than it will to install it. I agree- post and board fencing nearly lasts forever. My parents moved into an old house with one that seemed to be old already. That was fifteen years ago, and the fence is still intact! Also, it doesn’t require as much maintenance as you would think and is good at keeping animals contained. Dead composed subject material, Really enjoyed examining. You wrote this almost 8 years ago and it’s benefit lives on to the public. Now I know how to approach a fence I need to build on a property I’m brand new to. Thanks for this helpful post. 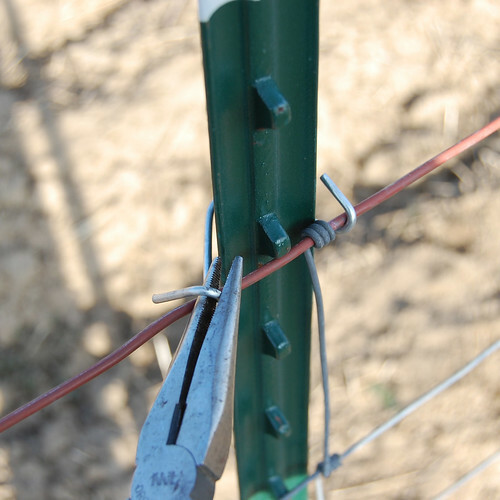 What’s up,I log on to your blogs named “How to Install a Woven-Wire Fence – DIYdiva” daily.Your story-telling style is awesome, keep up the good work! And you can look our website about proxy free list. I’m in the process of taking out a woven wire corral fence put in 60 years ago. There is a clip on almost every wire and the end wrap is stapled 4 time per wire! I can hear some old man saying ” That how they build fence at the stock yards in Omaha.” Yeah, but they don’t plan on ever taking it down. 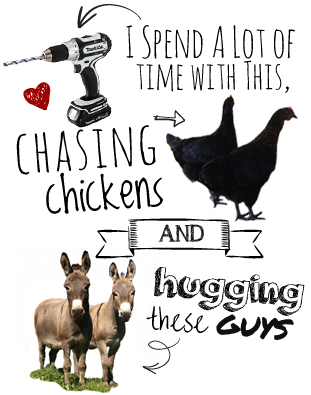 I need to fence in one donkey and 25 chickens. 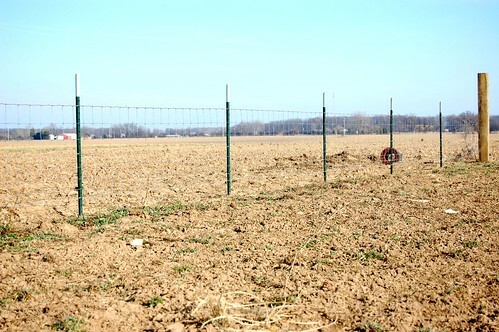 How big an area is needed and what type of wire fence is needed. I intend to use t-post, I don’t intend to make corner post as this is temporary till my daughter & son$in$law find a place of their own. Any suggestions you have are valued as i’ve never built a fenced in area before. Keeping cost to a minimum is important.